In this fact sheet, students will read about indoor theatres, how they differ from outdoor and how indoor theatres have become the norm over time. Indoor theatres grew out of temporary theatres in existing buildings set up for private performances; but they were open to the public and charged an entry fee. The first permanent indoor theatre (St. Paul’s) was built in 1575 and the next (Blackfriars) in 1576. How were they different to outdoor playhouses? smaller than outdoor playhouses, holding about 500 people, not thousands. built inside an existing building, so not open to the sky. more expensive (ranging from 6d to 2s and 6d), compared with open yard standing (at 1d) as in outdoor playhouses. lit by candles as well as daylight through the windows. Who acted in indoor theatres? Until 1609 the indoor theatres were used by boy companies. Adult companies played at the outdoor playhouses. The boy companies grew out of choir schools and other schools that performed privately. They were made up of boys of any age between seven and their early twenties. They usually played just once a week, rather than almost every day, as the adult companies did. 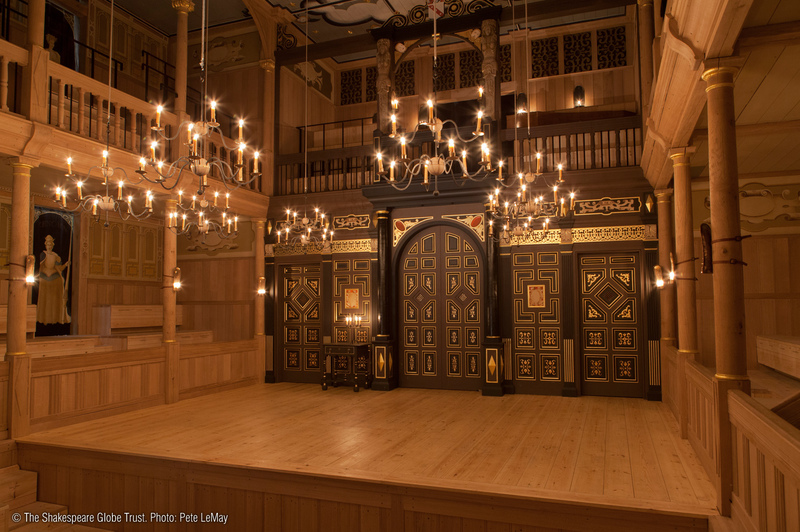 In 1596 James Burbage leased a building and built the Blackfriars indoor theatre. He wanted his adult company to play there. Local residents complained so much, that he was refused permission. He rented it out to a boys’ company in 1600, but kept trying to get permission for his company to use it. After objections were not upheld he got permission in 1609. The indoor audience was thought to be more educated and richer than a outdoor one. Scholars used to think indoor theatre plays had more music, more more small, sparkly props such as jewels and pearls, and more speeches than action. Plays written for the boy companies (e.g. Cynthia’s Revels, written by Ben Jonson in 1600) certainly did. When the King’s Men (the adult company Shakespeare was part of) used both the Globe and the Blackfriars, they played some popular plays in both theatres. There were practical reasons why some plays were better suited to indoor theatres. Indoor theatres had a small stage (about half the size of an outdoor theatre’s stage). There were also stools allowed on the stage: the most expensive seats, where rich ‘gallants’ sat to be seen as well as to watch. This gave the actors far less space for big battles or crowd scenes. On the other hand, the smaller space and the candlelight enhanced a play’s magical effects. Shakespeare wrote The Tempest with the Blackfriars theatre in mind, as well as A Winter’s Tale and Cymbeline. The candles also mean that there had to be breaks for people to trim the candles, or replace the burnt out ones. They were probably only short breaks, rather than the kinds of interval you get in a modern theatre performance. 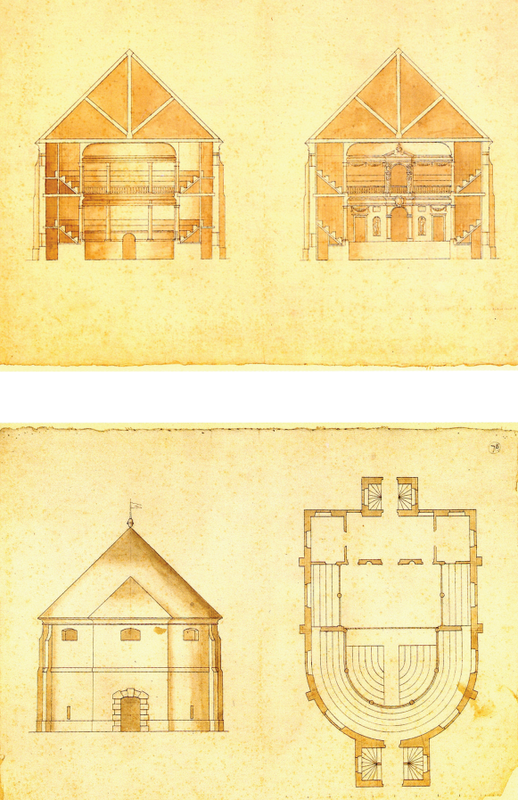 Seventeenth century drawings by John Webb of plans for an early indoor theatre that was probably never built. They show the curved galleries and boxes for the audience to sit in beside the stage. Held at Worcester College Oxford.